Green Card giveaway winner announced! Thanks so much to everyone who stopped by to check out the interview with Elizabeth Adams and the excerpt of Green Card!!! You guys were awesome with your support! I’ve had the most ever views for an indie publisher I’ve featured! Let’s keep that going all year long! 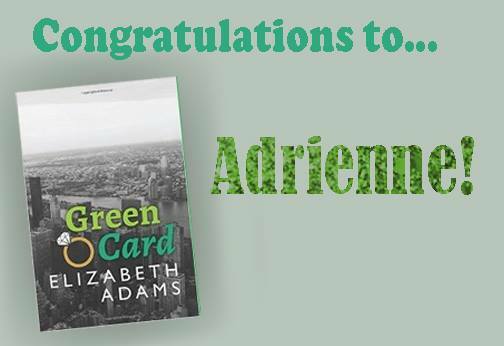 Congrats Adrienne and thank you, Elizabeth Adams, for hosting the giveaway!